Bohol and Palawan are sharing “best practices” through a partnership to advance eco-tourism and development in the two prime Philippine destinations. Gov. Edgar Chatto and Gov. Jose Alvarez on Friday night formalized the partnership dubbed the Bohol-Palawan/Puerto Princesa Tourism and Environmental Programs and Development Policy Exchange. Boholâ€™s Chatto and Palawanâ€™s Alvarez inked the enabling memorandum of agreement at the Palawan Capitol Social Hall where the linkage slogan â€œWe grow togetherâ€ echoed. Tagbilaran City Mayor John Geesnell Yap II and Puerto Princesa City Mayor Luisito Bayron on the same occasion forged a city sisterhood pact. The United States Agency for International Development â€“ Strengthening Urban Resilience for Growth with Equity (USAID-SURGE) facilitated the exchange program. The program strengthens sustainable tourism and policies on environmental preservation amid the growth and development of the partner provinces and cities. Nature conservation in Palawan is considered a Philippine benchmark that can enrich and enhance Boholâ€™s own innovations and practices for sustainable, enduring eco-tourism. The League of Municipalities of the Philippines (LMP) â€“ Bohol Chapter is also a party to the partnership. Policy development exchange is essential because the partnership engages local government units (LGUs), Chatto said. 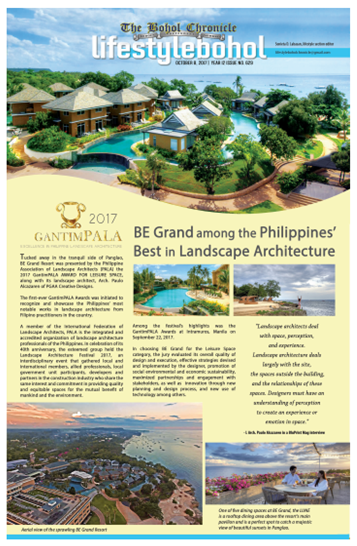 Bohol and Palawan have likewise these in common—both have island towns, three congressional districts, and one city which is also the provincial capital. Host officials themselves took turns of sharing best practices not just on tourism and environment but also agriculture, culture and arts. The continuing pursuit of sustainable development and excellent governance through the exchange program has not Â tied Bohol and Palawan singularly. In the morning also on Friday, Boholano priest Fr. Socrates Mesiona was installed the new bishop of Puerto Princesa, replacing 20-year serving Bishop Emeritus Pedro Arigo. Chatto led the public officials from Bohol who witnessed the church event. A guided tour coordinated by the provincial and city tourism officers brought the Bohol group to the different known Palawan program sites and environs. A fitting â€œpreludeâ€ to the formalizing of the partnership with Palawan, the Bohol tagline â€œBehold Boholâ€ was officially launched in Metro Manila on Thursday. The catchphrase is Boholâ€™s newest branding as a premiere tourist destination in the country with the support of provincial governmentâ€™s partners AirAsia Philippines, Department of Tourism (DOT) and USAID. Through its COMPETE Project, the USAID has assisted in Boholâ€™s rehabilitation from the great earthquake, particularly in the formulation of the tourism recovery masterplan. The governor himself led the Bohol stakeholders attending the launching, which gathered the officials of theÂ AirAsia, DOT and USAID. DOT Usec. Alma Rita Jimenez said she was â€œamazed by the progressive increaseâ€ in the number of Bohol tourists despite the merciless earthquakeâ€™s impact. She said Bohol as one of the Philippine destination icons has simply been validated, again. The launching was also attended by Rep. Rene Relampagos, former House tourism committee chairman; Rep. Arthur Yap, House economic enterprise committee chairman; and Ebb Hinchliffe, executive director of the American Chamber of Commerce of the Philippines.